We are launching our latest edition of the PCMA industry magazine through a new digital publishing platform that will transform how we read and share private capital markets news. Bringing together every article from previous editions, and all of our new editions content, we have created a searchable library of sophisticated industry analysis and insight – accessible wherever you are, and whenever you need it. We hope this new magazine platform will enable a richer dialogue across our industry. Please share this magazine and the articles you are most interested in with your colleagues and contacts – if they aren’t part of our discussion yet, invite them in. 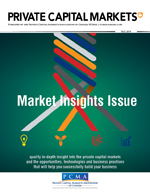 Our Fall 2014 edition features more high quality, in-depth insight into the private capital markets and the opportunities, technologies and business practices that will help you succeed. If you missed a previous edition don’t worry, you can find it here. If you are interested in writing for our next edition or advertising please contact Elena Mazur: elena.mazur@pcmacanada.com by January 9, 2015. Find the industry audience you were looking for – our advertising rates are here. PCMA Members receive 15% discount on print ads.